Mormonism / Jesus Christ of Latter-Day Saints - Is It a Christian Religion? John 1:4 and 14 - In the beginning was the Word and the Word was with God and the Word was God. The same was in the beginning with God. All things were made by him and without him was not anything made that was made. In him was life and the life was the light of man. And the Word became flesh and dwelt among us and we beheld his glory, the glory as of the only begotten of the Father full of grace and truth. Genesis 1:1 - In the beginning God created heaven and earth. 2. “God himself was once as we are now, and is an exalted man…”(Teachings of the Prophet Joseph Smith, 345) John 4:24 - God is a spirit and they that worship him must worship him in spirit and in truth. 3. “The Father has a body of flesh and bones as tangilble as man’s; the Son also; but the Holy Spirit has not a body of flesh and bones, but is a personage of Spirit…” (Doctrine and Covenants, 130:22) *See verse for #2, plus Hebrews 13:8 - Jesus Christ is the same yesterday, today and forever, and also I John 5:7 - For there are three that bear record in heaven, the Father, the Word and the Holy Ghost and these three are one. 4. “God exists and we had better strive to be prepared to be one with them” (Brigham Young, Journal of Discourses 7:238) Romans 10:9 That if thou shalt confess with thy mouth the Lord Jesus and shalt believe in thine heart that God hath raised him from the dead, thou shalt be saved. 5. “As man is, God once was: as God is, man may become” (Prophet Lorenzo Snow, quotedin Milton R. Hunter, The Gospel Through the Ages, 105-106) See verse for #2 and also Matthew 22:30 says - For in the resurrection they (people) neither marry nor are given in marriage but are like angels in heaven. 6. Remember that God, our heavenly Father, was perhaps once a child, and mortal like we ourselves, and rose step by step in the scale of progress, in the school of advancement; has moved forward and overcome, until He has arrived at the point where He now is” (Apostle Orson Hyde, Journal of Discourses, 1:123) Psalm 18:30 - As for God, his way is perfect. Matthew 5:48 - Be ye therefore perfect, even as your Father which is in heaven is perfect. 7. 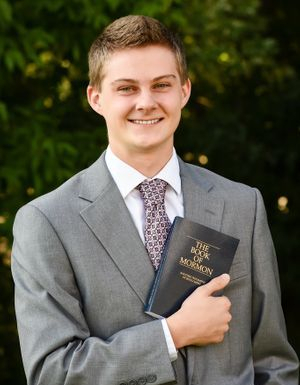 “Mormon prophets have continuously taught the sublime truth that God the Eternal Father was once a mortal man who passed through a school of earth life similar to that through which we are now passing. He became God—an exalted being—through obedience to the same eternal Gospel truths that we are given opportunity today to obey” (Hunter, op.cit., 104) Revelation 19:6 - Alleluia, for the Lord God omnipotent reigneth. Psalm 102:27 - But thou art the same, and thy years shall have no end. Exodus 3:14 - God said unto Moses, I AM THAT I AM. 8. When our father Adam came into the garden of Eden, he came into it with a celestial body, and brought Eve, one his wives, with him. He helped to make and organized this world. He is Michael, the Archangel, the Ancient of Days! About whom holy men have written and spoken—He is our FATHER and our GOD, and the only God with whom we have to do” (Brigham Young, Journal of Discourses, 1:50) Genesis 2:7 - And the Lord God formed man from the dust of the ground and breathed into his nostrils the breath of life and man became a living soul. Genesis 2: 21- 23 - And the Lord God caused a deep sleep to fall upon Adam and he slept; and he took one of his ribs and closed up the flesh instead thereof; and the rib which the Lord God had taken from man, made he a woman, and brought her unto the man. And Adam said, This is now bone of my bones, and flesh of my flesh: she shall be called Woman, because she was taken out of Man. I Corinthians 15:22 - For as in Adam shall all die, even so in Christ shall all be made alive. Jesus 14:6 - Jesus saith unto him, I am the way, the truth and the life: no man cometh unto the Father, but by me. Hebrews 1: 5 For unto which of the angels said He at any time, Thou are my Son, this day have I begotten thee? And again, I will be to him a Father and he shall be to me a Son? Mark 16:19 - So then after the Lord had spoken unto them, he was received into heaven and sat at the right hand of God. 9. Jesus is the brother of Satan this is revealed in the Pearl of Great Price, Book of Moses 4:1-4 and affirmed by Brigham Young in the Journal of Discourses, 13:282) John 3:16 - For God so loved the world that He gave his only begotten Son, that whosoever believeth on him should not perish but have everlasting life. Revelation 12:9 - And the great dragon was cast out, that old serpent, called the Devil and Satan, which deceiveth the whole world; he was cast out into the earth and his angels were cast out with him. 10. Jesus also married Mary and Martha and the other Mary at Cana of Galilee, “Whereby he could see his seed, before he was crucified” (Apostle Orson Hyde, Journal of Discourses, 4:259; 2:82) Isaiah 53:7, 8 - He was oppressed and he was afflicted, yet he opened not his mouth; he is brought as a lamb to the slaughter and as a sheep before her shearers is dumb, so he opened not his mouth. He was taken from prison and from judgement and who shall declare his generation? for he was cut off out of the land of the living; for the transgression of my people was he stricken. See the above referenced website for the rest of the Mormon beliefs on Jesus, Satan, Eternal Life etc. And google the subject matter of each Mormon belief by putting in the preface KJV so you can see what the KJV Bible says in regards to Mormon doctrine. Also Joseph Smith and Brigham Young's life stories are explained in detail so you can see the roots of Mormonism are full of lies and occultic powers. A good indicator of a cult is any religion or denomination that has an extra book that they refer to along with the Bible. Also, if religion or denomination has created their own version of the Bible you know you are dealing with a cult. Many people only see the clean cut, morale people that belong to the Mormon church and don't know about its occultic roots. The following is from website http://saintsalive.com/resourcelibrary/mormonism/satanic-rituals-within-mormonism. 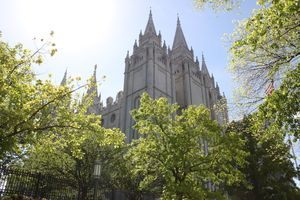 Most reports of the LDS Church's problems with satanic abuse do not mention that Mormonism was originally brewed in a seething cauldron of occultism, sorcery and blood sacrifice. Contrary to the charming tale of the "First Vision," the actual beginnings of Joseph Smith's spirituality were steeped in witchcraft. First, Joseph Smith, Sr. and his entire family were casting magic circles and practicing the "faculty of Abrac," according to Joseph Smith, Jr.'s own mother, Lucy Mack Smith! Abrac is short for Abracadabra, and is a common, old-fashioned way of saying that they practiced ‘folk’ magic. Joseph Smith himself practiced "glass-looking," a 19th century term for scrying or crystal-ball gazing. He was even convicted of this in a Bainbridge, NY court. In fact, Joseph's annual meetings (on a witchcraft holiday) with the angel Moroni on Hill Cumorah were actually attempts to conjure up a demon spirit through magic and necromancy. There is strong evidence that in 1824 he actually had to dig up the body of his dead brother, Alvin, and bring part of that body with him to the hill to gain the gold plates! See “A Necromantic Incident” on our website for the full story. Jo [sic] Smith the prophet, told my uncle William Stafford, he wanted a fat black sheep. He said he wanted to cut its throat and make it walk in a circle three times around and it would prevent a pot of money from leaving. Smith's participation in this kind of occult ritual is born out by several other testimonies. Additionally, after his death, Smith was found to be carrying a magic talisman on his person sacred to Jupiter, and designed to bring him power and success in seducing women. Now, with un-Biblical practices like that at its roots, how could the tree of Mormonism be anything else but sinful and occult? As has been frequently shown, the sacred temple rituals of the LDS Church are grounded in Masonry and witchcraft. Even the icons on the outside walls of the older temples are right out of witchcraft text-books. Additionally, there is the precedent set by Joseph Smith with his "sacred" marriages to dozens of women; some of them already married! Mormons cry out in righteous anger about the sexual abuse of children and young adolescents. They need to recall that Joseph Smith's first "plural wife" was a barely pubescent teenager named Fanny Alger who was living right in their home. 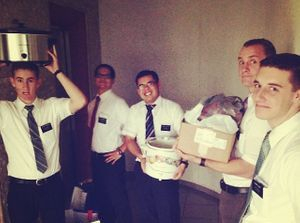 Mormon missionaries travel in twos and are dressed the same, (usually with jackets, not seen here), and they serve for two years bringing "another gospel". Beware if they approach you because they are trained to use Christian terms to persuade people into their cult. They are skilled at proselytizing so unless you know Scripture like the back of your hand, you don't want to engage in conversation with them. Maybe just hand them a Christian tract that exposes their false religion and pray for them. Also beware of non-denominational sounding church names such as "Community of Christ" because there is one that I know of for sure with that name that is a Mormon church. Be sure to check into any Christian church before attending, google them or call them and ask them specific questions. You don't want to put yourself into their web because they are good at spinning things and it can cause you distress and even confuse you spiritually.